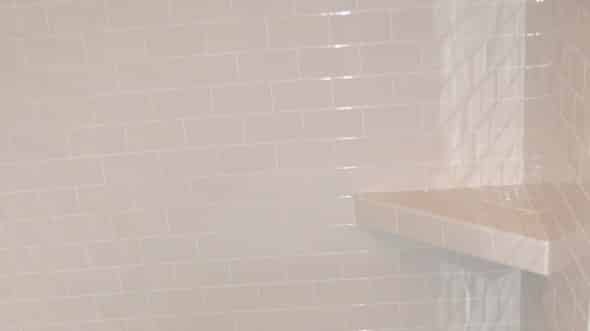 In this third and final article of the How To Build a Shower Series, we discuss finishing your shower with tile. In the first two articles of our Building a Shower Series, we walked through the framing, plumbing and shower pan construction of building a walk in shower. 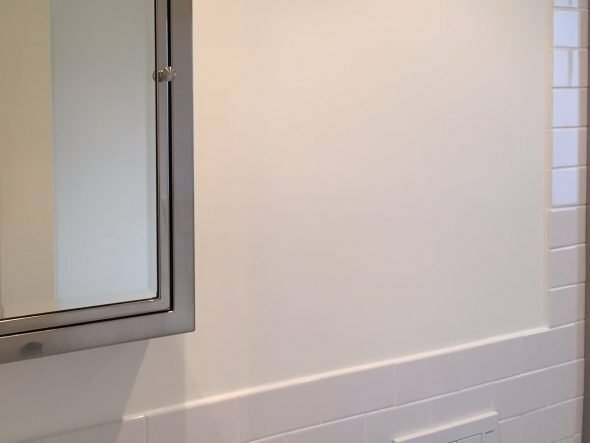 In this third and final article, we document the final steps to completing your shower — preparing for and installing shower tile. Prior to starting this final step of your shower construction project, you should have completed the framing, plumbing, and shower pan construction steps (Articles 1 and 2 above). Prior to starting the tiling process, all supply and drain plumbing should be installed, tested and ready to go. Your mixing valve(s) should be in place and calibrated as needed. 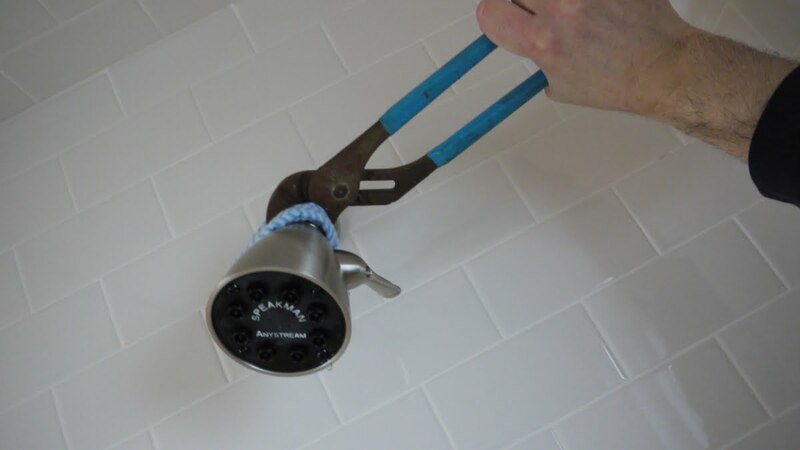 The supply lines to future shower heads should be installed, properly supported and terminate with a securely mounted drop ear elbow or suitable fitting that is stubbed out and capped. Once the above steps are complete, its time to tile your shower! Shower framing and tile backer board installed. Shower pan and drain complete and ready for tile. The first step of tiling a shower is to create a stable, tile-friendly surface. Tile installations require a fairly flat, stable surface that is appropriate for the adhesive thin-set mortar used to install tile. 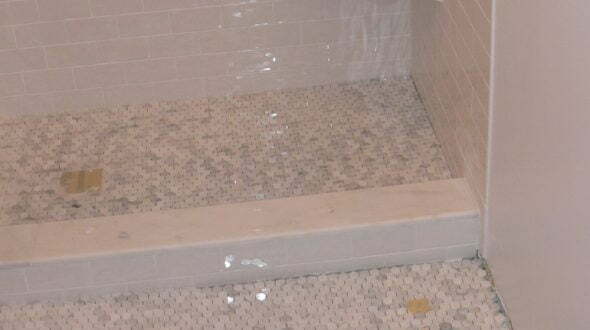 For wet environments (like a shower), tile backing surfaces must be appropriately water resistant. In general this means installing cement based or similar tile backer board. 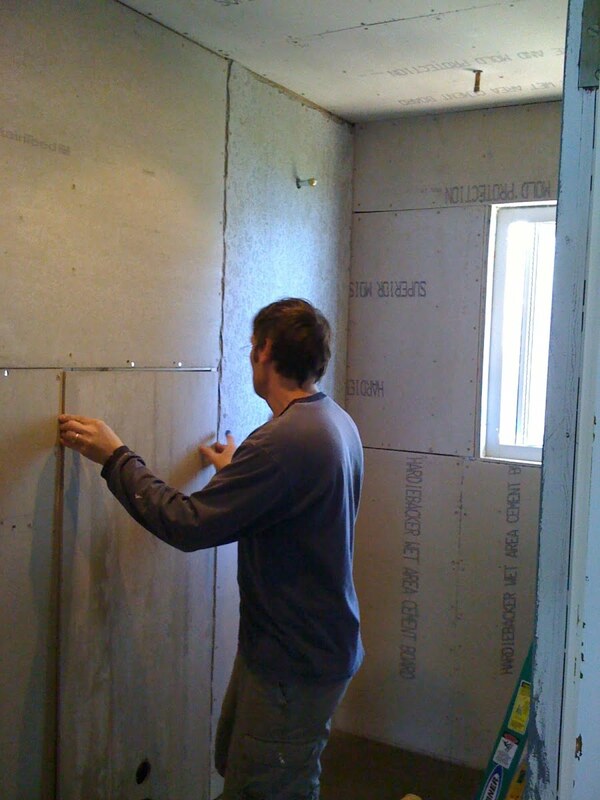 Years ago, water-resistant gypsum wallboard (“green board”) was used as a low-cost wall sheathing and tile backer in wet areas like showers. This product, a wax coated gypsum wall board, routinely failed in wet environments. Building codes now prohibit the use of these products as the tile backer in showers. Do not use Greenboard as a tile backer in showers! For my shower project, I used HardieBacker fiber cement backer board. I chose this product over fiberglass reinforced cement board (Durock or similar) for its performance in wet areas and smooth surface. Not only did I plan to install tile backer board for the shower, but the entire bathroom. HardieBacker’s smooth surface made the non-tile areas easy to paint. As further waterproofing for the bath and shower, I added a paint-on moisture barrier. I applied this barrier over the HardiBacker in the shower and behind the sink and toilet in the bathroom. Although wet-area approved tile backer boards are quite water resistant, many do not stop the movement of water. Vapor barrier requirements depend on local codes and specific applications (Steam Shower use, etc.). 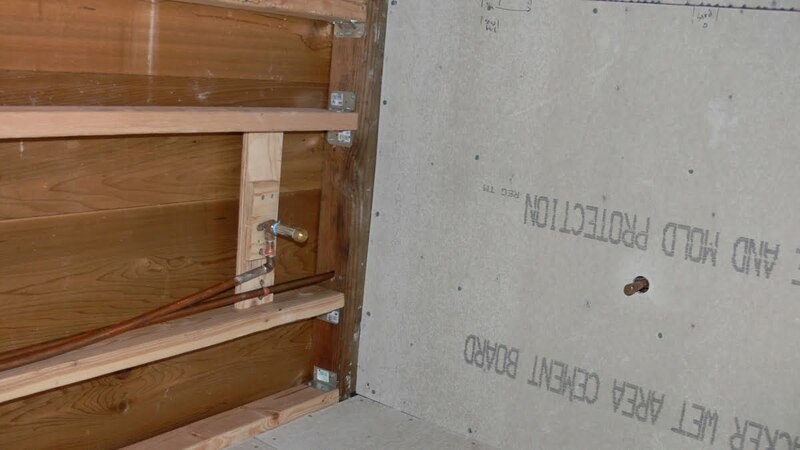 Most installations in showers should have either a vapor barrier behind the backer board (poly sheeting) or one on top of the backer board (paint-on membranes) applied before tiling. I prefer paint-on barriers. I like the idea of blocking water before it passes through the cement board. Also, consider that any vapor barrier behind the cement board will have fastener penetrations compared to the continuous, uninterrupted barrier that a paint-on product provides. Two commonly available paint-on membranes are; Redgard (Custom Building Products, Home Depot), HydroBarrier, and Hydro Ban (Laticrete). I used Hydro Barrier by Laticrete (highly recommended). Both products allow thin-set tile adhesives to be applied directly to the membrane once it has dried. Once you have installed, taped and waterproofed your tile backer, its’ time to install your tile. So What Is Tile And How Is it Installed? Tiles are thin flat pieces of clay, stone, or other material used as a construction surface finish. 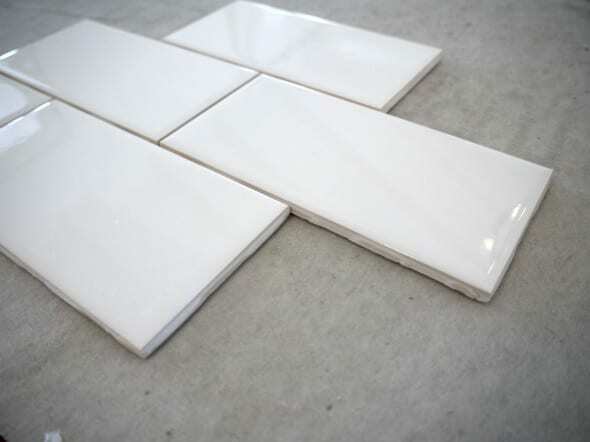 Tile is often used to finish floors, walls, showers, pools, patios, and counter-tops. Tile finishes are very durable and perform well in wet environments. Tiles are installed side-by-side using mortar based adhesives called thin set. The gaps between the tiles are then filled with grout; a durable filler often mortar-based with or without sand. Select a tile backer board approved for shower use. 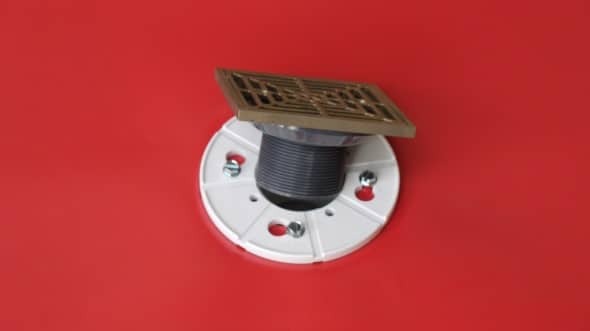 Install the backer board with backer board screws or roofing nails (both approved by The Tile Council of North America). Most panels can be installed horizontally or vertically – check the installation instructions for your product. HardieBacker 1/2″ backer board installed with 1 5/8″ backer board screws in shower. 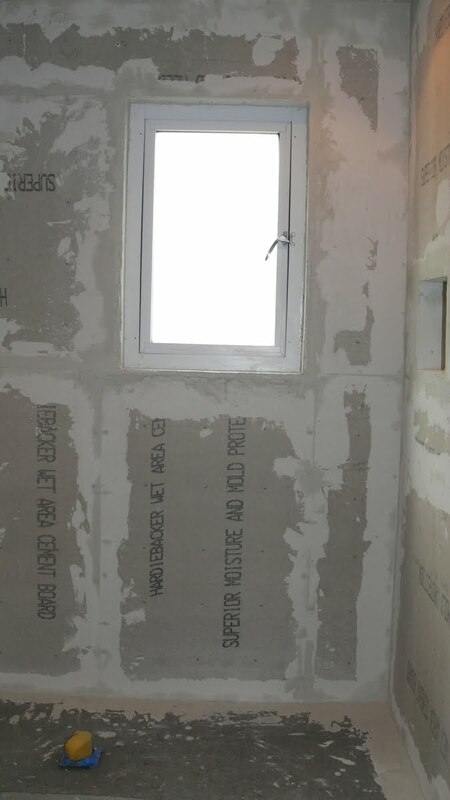 We used HardieBacker fiber cement backer board for our shower. 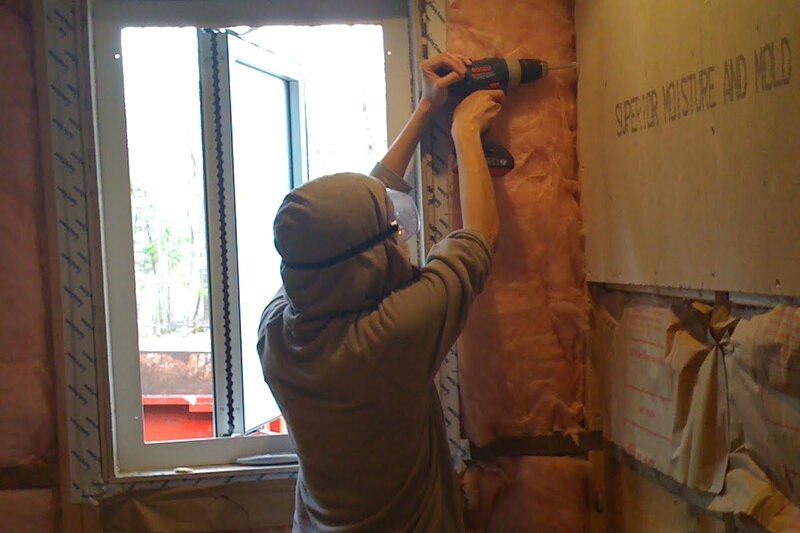 We fastened the backer board using Buildex Backer-On screws. We found it a bit difficult to get these screws flush with the HardiBacker board. Roofing nails may be a better match with HardieBacker as the heads are thin and very easy to nail flush. Portland cement based backer boards contain silica sand. Cutting these products can create dangerous silica dust. Use specially designed shears or score and snap techniques to cut cement board to avoid silica dust formation. 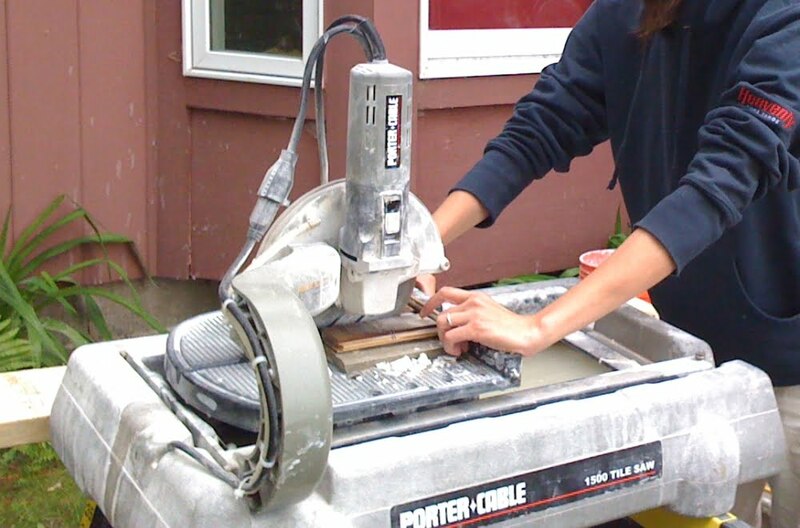 When cutting any cement board product, use great care to avoid silica dust formation and exposure. Exposure to silica dust is linked to lung cancer and the lung disease silicosis. Always wear an approved dust mask (N-95) when working in the presence of silica dust. Use manufacturer approved cutting methods (shears, score and snap) and clean up (HEPA filter vacuums or wet clean up, avoid sweeping or methods that create dust). Most panels can be cut by scoring and snapping similar to dry wall. Specially designed carbide tipped scoring tools are available for this purpose. Cutting shower backer board using specialized carbide tip tool to score and snap panel. Refer to recommendations from the product manufacturer for specific guidelines on cutting the product you are using. Always wear a particle mask or respirator when working with these products. Avoid using of high-speed power tools (grinders, circular saws) unless they are have attached dust evacuation systems. When mounting the backer board, horizontal blocking is not necessary for most boards but does add stability (we added horizontal blocking, where it was simple to do). Reference the installation instructions for the product you plan to use for specifics on panel direction and framing requirements. As with all sheathing, be sure to gap panel edges by 1/8″ – 1/4″. Use 1 5/8″ screws or 1 1/2″ roofing nails to provide at least 3/4″ fastener penetration into studs for ceiling mounted backer board. We also used the HardieBacker for the ceiling. If you plan to sheath your ceiling with backer board, use long fasteners — 1 1/2″ roofing nails or 1 5/8″ screws at the minimum. Fill and reinforce backer board seams. 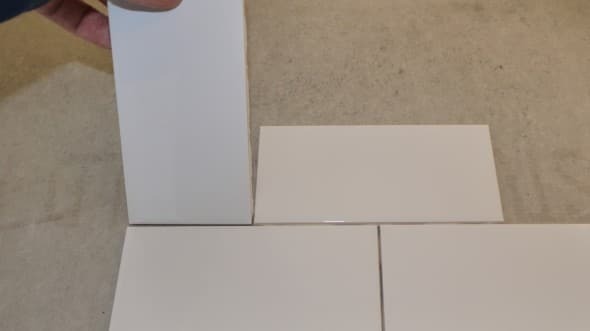 Once the backer board is installed, use the thin-set you plan to set your tiles in (likely a latex modified thin-set) to fill the gaps between the backer board panels. Over this thin-set, apply cement board approved (alkali-resistant) fiberglass mesh tape. Smooth seams and tape with additional thin-set. See #6 below for more information on mixing thin-set mortar. Shower backer board installed. Seams filled with latex modified thin-set and reinforced with alkali-resistant fiberglass tape. Apply paint-on waterproof membrane (optional, but recommended). Waterproof your shower by applying a paint-on surface water barrier. Shower approved tile backer boards are tolerant of water, but they do not stop it. Protect your framing and wall cavities by applying a vapor barrier. 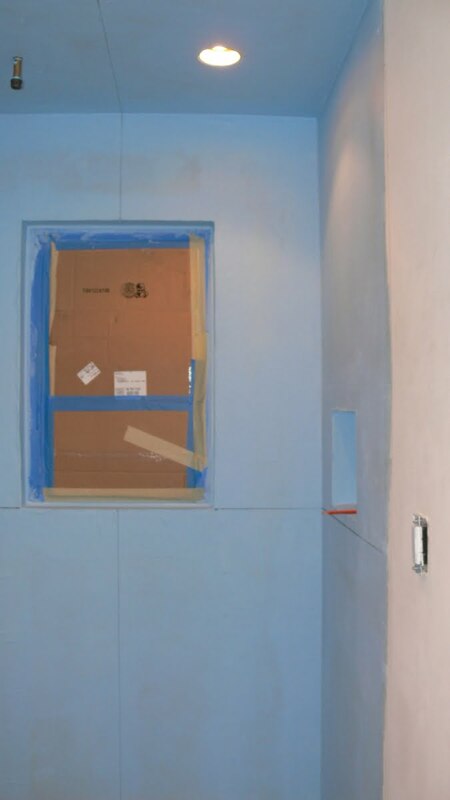 Hydro Ban paint-on waterproof membrane applied to shower walls and ceiling. Although it is acceptable to use plastic sheeting installed behind tile backer board as a vapor barrier, it is not the best practice. 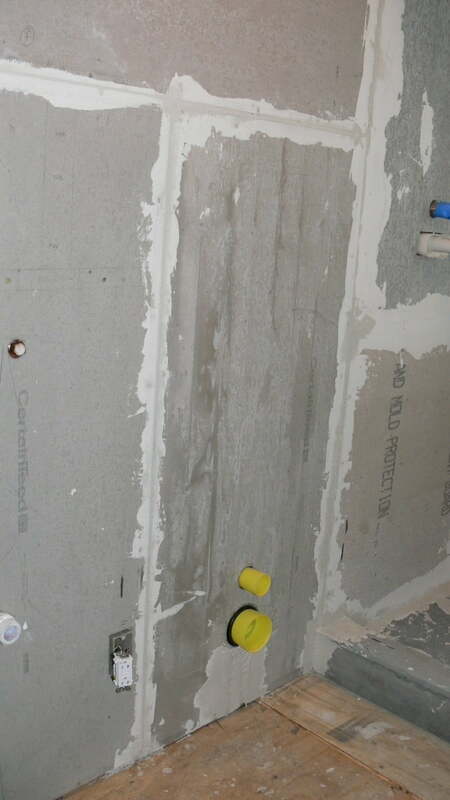 Using paint-on waterproofing barriers block water at the surface of the backer board. Why not deny water passage into your wall, instead of trapping it behind the backer board with plastic sheeting? There is a variety of paint-on products available. I used HydroBan from Laticrete. This paint-on product is easy to apply and does not require fabric reinforcement at the corners and seams (some products do). Although no fabric reinforcement is necessary, corners, penetrations, floor-wall transitions and other critical areas should be pre-treated with a liberal application of the product prior to applying two field coats. Allow the product to cure before setting tile (2 hours for Hydro Ban). Most paint-on membranes allow the use of thin-set adhesives directly over the paint-on membrane once cured. Plan the layout of your shower tile. Start with a level baseline just above the shower pan. Mark significant structures (the window in our case) with a horizontal reference around the shower to help plan tile seems. Plan out tile install. Start with level reference. Mark the walls with horizontal and vertical reference lines prior to setting tile. Notice plaster guards over mixing valves prior to starting tiling. Dry install tiles or use a “story pole” (a stick with markings that reference stacked tile seams to help plan tile install) to adjust your base starting height to facilitate tile seams falling on desired targets (the window ledge, for example). Once desired baseline starting point is established, create a level base for the initial row of tile using a straight edge, level or similar. This base should start a tile width or more above the shower pan. For our base straight edge, we used several inexpensive plastic levels supported by blocks. From this horizontal reference, draw a single or multiple vertical plumb reference lines on the to be tiled wall to help maintain a uniform, straight and level tile install. 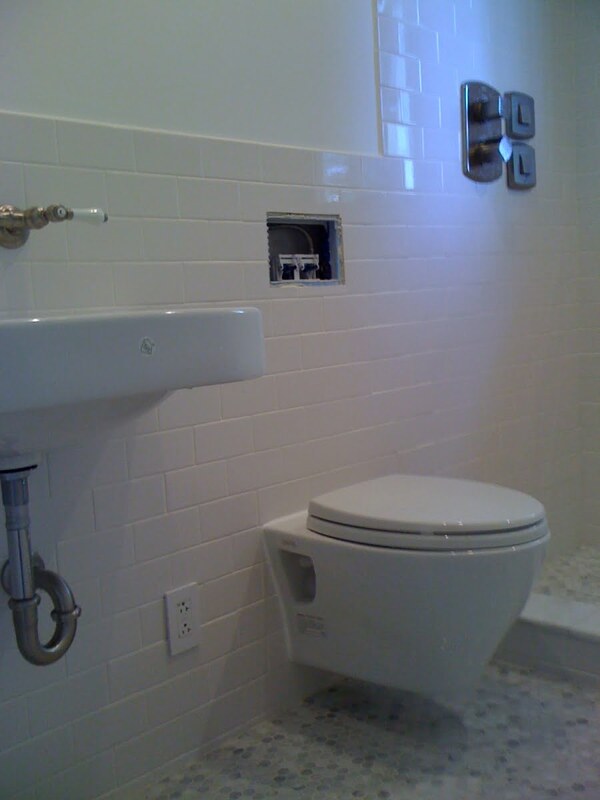 Prior to installing tile, ensure that mixing valve components are protected with included plaster guards or tape. Prepare for tile install, plan tile spacing. Prepare to install tile by collecting all necessary supplies, tile and tools. Once thin-set is mixed and applied to the wall, you will have a fairly short period of time to set the tiles. 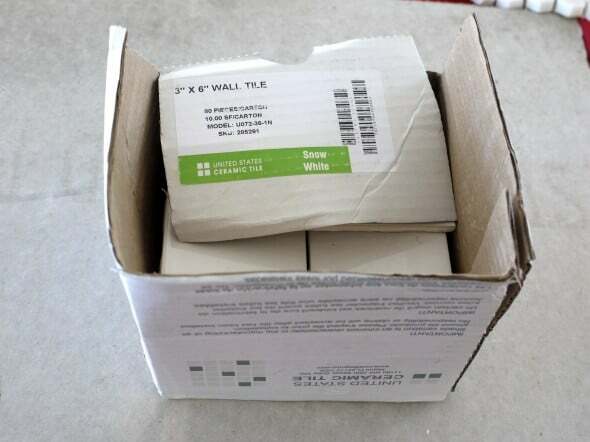 You should have everything ready to set tiles once the thin-set is applied.For our shower tiles, we used off the shelf 3″ x 6″ white ceramic subway tiles from The Home Depot. These tiles did not require the use of tile spacers as they have self-spacing nubs on their sides. Installing the tiles using these self-spacers provides a grout seam of ~ 1/16″. You could always use these same tiles with larger spacers to create wider grout lines if you like. White subway tiles from The Home Depot we used for our shower and bathroom. Self-spacing tabs on the edges of each tile side provide a 1/16″ grout line. Depending on the tile you plan to use, you may benefit by using tile spacers to create a uniform gap between tiles. Tile spacers are small plastic pieces shapaed like plus signs (+) that come in a variety of sizes and are used to maintain uniform grout lines between tiles. 1/4″ “tombstone” tile spacers. Remove before grouting. If you plan to use tile spacers, decide on the proper spacer size and have them ready for use. In general, smaller tiles typically have smaller spacing (1/16″ – 1/4″) while larger tiles will be set with wider spacing (1/4″ – 1/2″). Most very small or mosaic tiles will be mounted on a mesh backing with fixed spacing between individual tiles. You will still need to control the spacing between these pre-mounted mesh sheets. 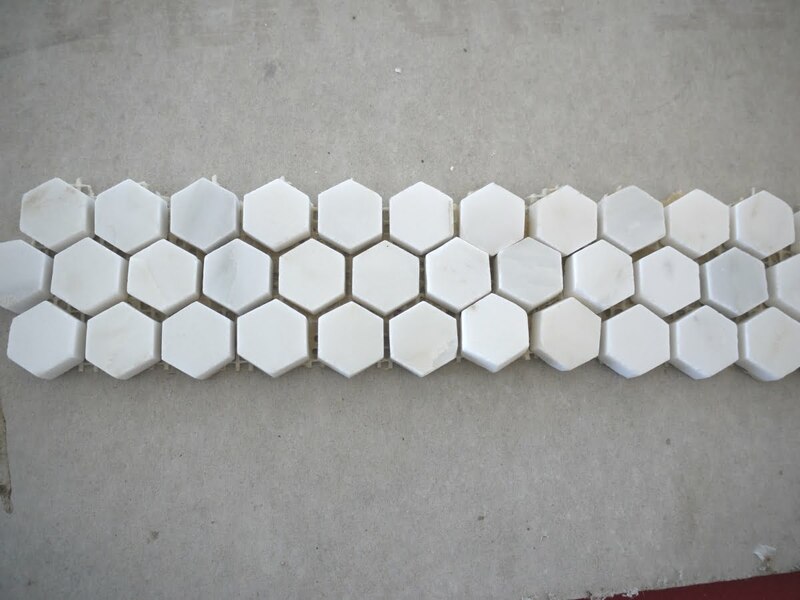 Mosaic marble tile mouted on mesh backing with pre-set grout gap. 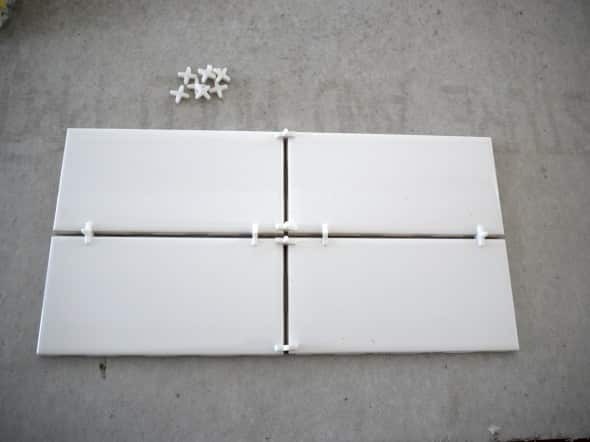 Once you have a plan for tile spacing, assemble enough tile (and tile spacers if using) to complete your initial thin-set application. Thin-set adhesives generally have short working times and should be mixed in small batches that can be completely used within the products working time. In general, this will be area equivalent of one 3′ x 5′ backer board sheet for small tiles and several sheets for larger tiles. For the 3″ x 6″ subway tiles we used, we found that we could easily cover the area of one 3′ x 5′ backer board panel with each thin-set batch. Using a five gallon bucket or similar, mix a small batch of thin-set according to the instructions given by the product you are using. We used latex fortified thin-set (Pro-Lastic from Superior Adhesives and Chemicals) from the Tile Shop. Here is a link to the Tile Shop’s How to Mix Thinset. For most products, start with just the liquid (water or latex if two-part) in the bucket. Slowly add the dry mortar while mixing. Continue to add the dry component until the thin-set has the consistence of peanut butter. Proper thin-set should stick to the bottom of a trowel when turned upside down. Mixing attachments for drills make the task of repeatedly mixing mortars and grout much easier. We used a mixing paddle connected to a 1/2″ heavy duty drill and I highly recommend doing the same. Apply thin-set and begin tiling main walls and ceiling. If you are unsure if the trowel you are using is the correct size, try installing a few tiles. The tiles should settle into the thin-set with good adhesion. If thin-set is oozing out of the grout spaces above the level of the tile surface, then there is too much thin-set and the notched trowel size is too large. 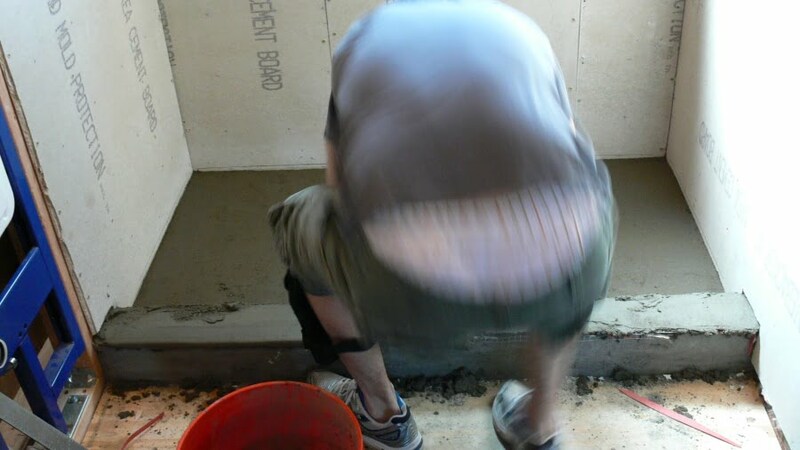 If you remove the trial tiles, you should see near complete coverage of the back of the tile surface, if there is insufficient mortar on the back of the tiles, the notched trowel size you are using is too small. Begin thin-set application above the starting point for your first row of tiles. Apply thin-set to an area that you believe you can finish tiling within the working time for the thin-set mortar product you are using (generally 10 – 20 minutes). Apply an uniform layer of thin-set using a notched trowel. Apply tile in small sections beginning at the base of the shower. Use a level straight edge to guide the first row. Start installing tiles beginning at the bottom row at a corner using the level straight edge base that you previously assembled. 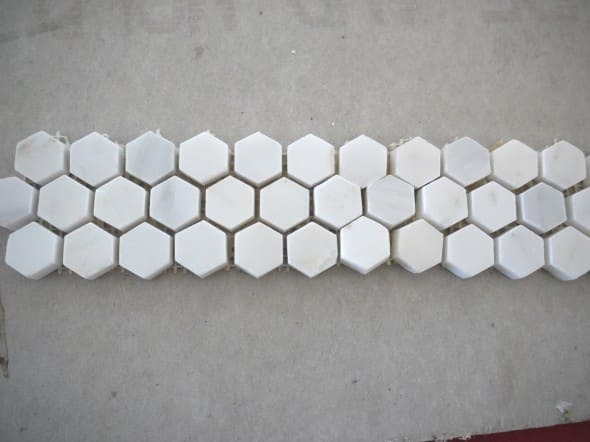 Set each tile into the thin-set mortar bed by applying gentle pressure and moving the tile back and forth slightly. As you install tile, reference the previously marked plumb vertical lines to ensure proper tile alignment. When staggering rows to install the subway tile in a “brick” pattern, a good trick to help center tiles is to use a tile turned sideways as a guide. Subway tiles are half as wide and they are long creating the perfect spacer. Use rotated subway tile as a guide for spacing. 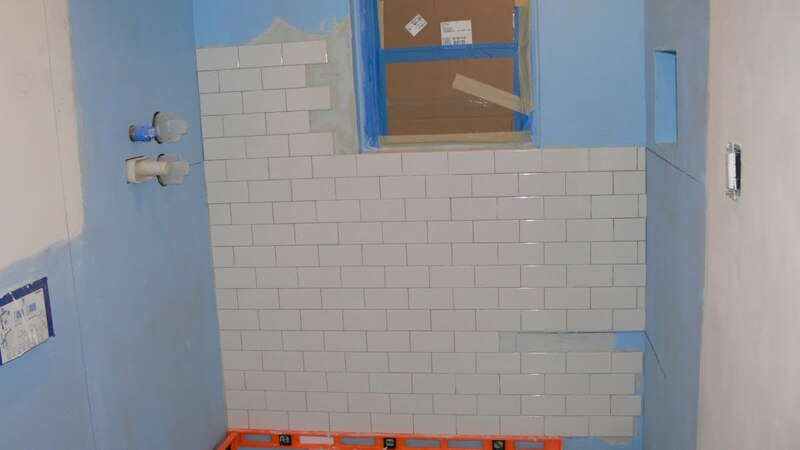 If you are using the traditional “brick style” subway tile install like we are, you will need half width pieces to start every other row at the beginning corner. Cut several full width tiles in half for this purpose. Continue tile install cutting tiles and using trim tiles as needed. For almost any tile job you will need to cut tiles. There are several ways to cut tile depending on the type of tile you are using. The best way is typically a wet tile saw. 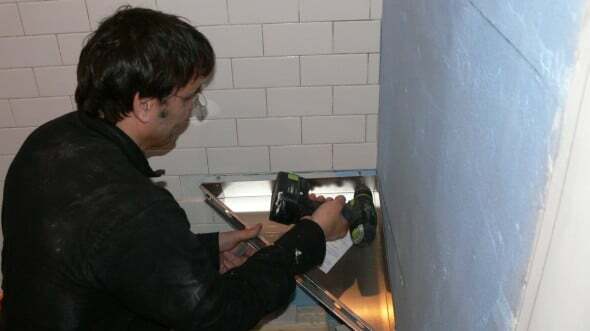 Many tiles can also be cut using a score and snap tool. Small cuts can be made with a hand nippers. Wet saws use hardened circular blades cooled by water to cut tile. Wet saws provide very clean cuts and typically employ a sliding guide that easily produces straight cuts. Wet saws can be expensive, but many home improvement stores rent tile saws and having a wet saw for a major tile project is often worth the money. 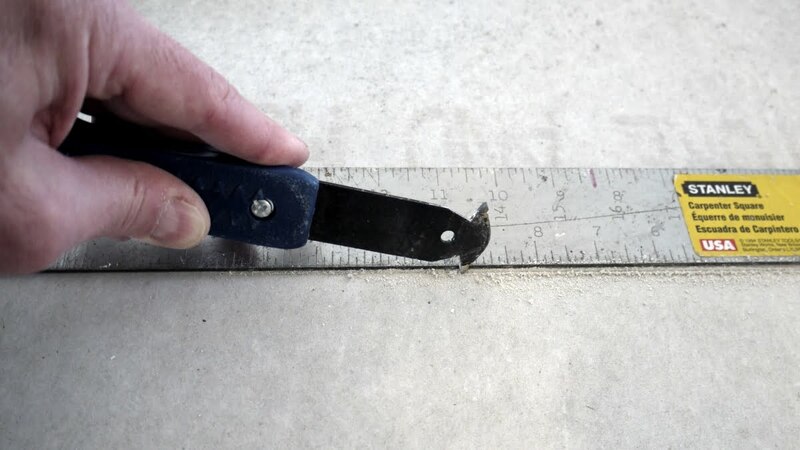 If you are using a thin ceramic (like the subway tile we used) or other easy to cut tiles, a simple score and snap cutter and hand nippers may be sufficient for your project. When cutting partial tile to end rows at the corner, cut the tile to fit with a small (1/8″ or so) gap. Cutting end pieces to close can cause tiles to buckle with wall movement and these small gaps will be covered by the adjacent wall tile. In addition to cutting tiles you will probably need a supply of various trim tiles depending on your project. Trim tiles offer easy transitions (coves, etc) and finished edges at corners and the end of rows (bull nose finish tiles). We used two types of bull nose finish tiles to complete the window edge, the shampoo niche and the leading edge of the shower. Continue to tile up shower wall maintaining plumb and level. Cut shorter pieces to fill in gaps at the corners. Complete tiling the shower walls, ceiling and curb. 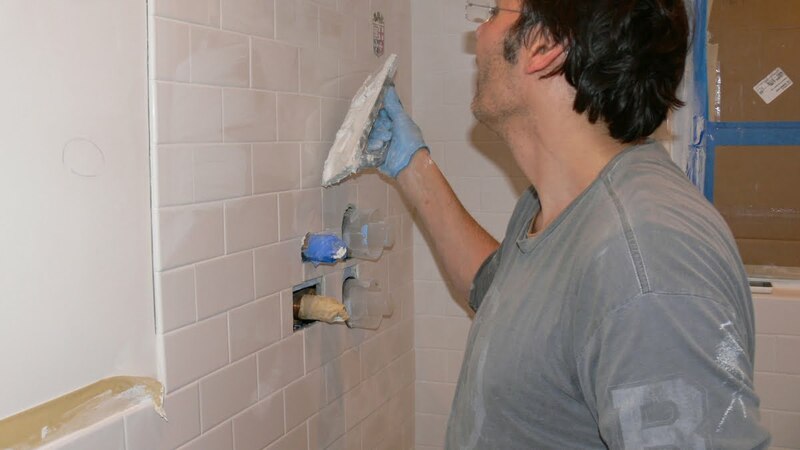 Continue setting tile working your way up and around the shower. Carry plumb and level lines onto side walls prior to setting tile. If you need to stop tiling during the process but have areas of un-tiled thin-set applied to the wall, simply scrape off the thin-set and reapply when ready to resume tiling. Almost finished setting tiles on shower walls and ceiling. Use trim tiles to finish edges and complete exposed tile edges. For this project we used short side bull nose tiles to finish the vertical leading edges of shower entrance (see below image) and for the window and alcove, and long side bull nose tiles to provide a finished edge for horizontal borders of the window opening and alcove. A small detail tile (angel) added to personalize the shower. Notice bull nose trim tiles to begin the front edge of the shower entrance. To personalize the shower, we added a few small tiles that we brought home from a trip to Italy. As long as the tile thickness is similar, it is quite easy to add a contrast or a detail tile within the tile field — just cut out the space for the tile leaving a grout gap to match the main tiles. 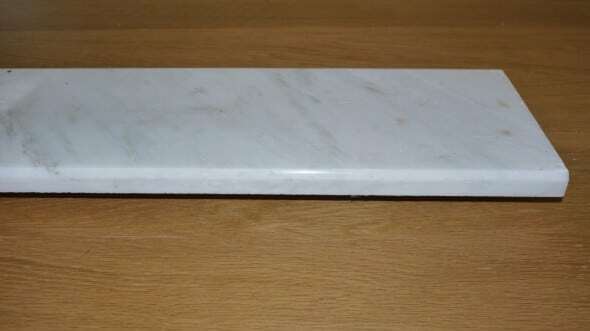 6.5″ x 36″ precut marble threshold for shower curb. 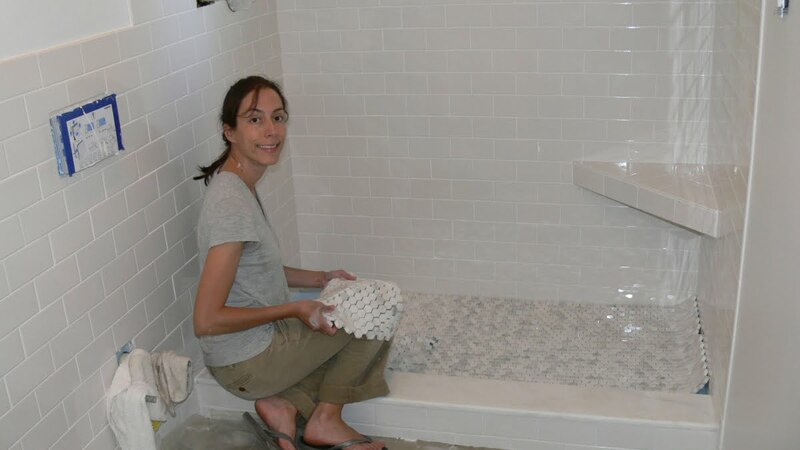 To tile the shower curb we used the same white subway tiles we used for the shower walls. 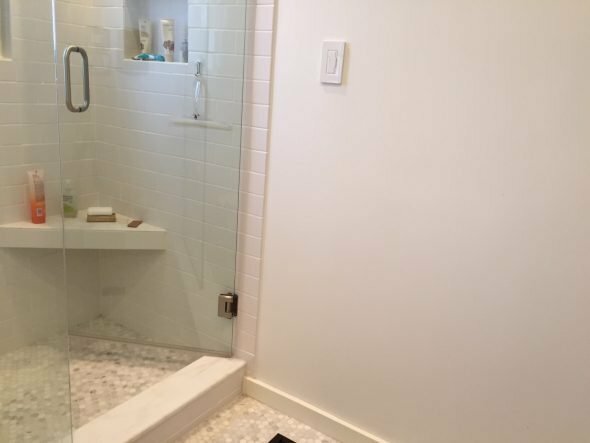 For the top or threshold of the shower curb, we used a 6 1/2″ x 3/4″ x 36″ pre-cut Carrara marble threshold from the Tile Shop. Thresholds made from many different materials are readily available from home improvement and tile stores. Our shower threshold was longer than 36″ so we needed to use two pieces seamed to fit our shower. Attach the threshold with latex modified thin-set mortar just like tile. The threshold should slope slightly toward the shower, so if your curb is not already sloped, slope the threshold slightly in the thin-set bed. Shower curb tiled with the same white subway tiles used for the shower walls and ceiling. 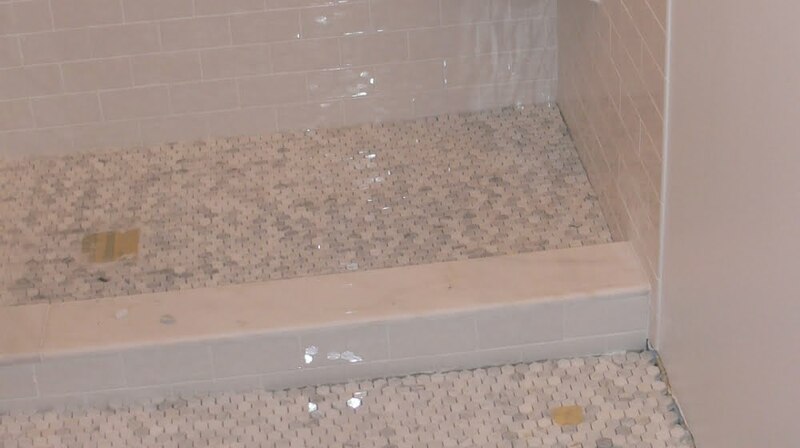 6.5″ marble threshold used to cap the shower curb. 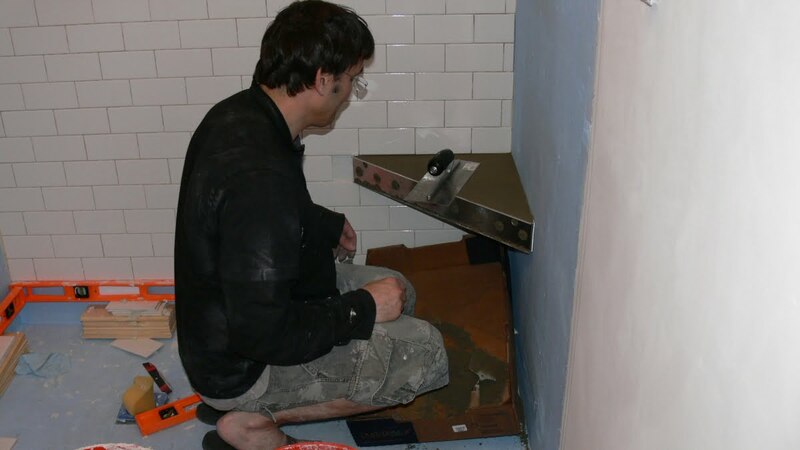 A shower bench can be built into the shower framing or added during the tiling process. We did not frame in a bench, but planned to add a bench during the tiling process. Better-Bench BB-24 triangular shower bench system. To build our shower bench we used the Better-Bench® system by Innovis Corp . The system features an aluminum pan which is mounted onto the shower wall and then filled with floor mud and tiled to create a very strong, concrete shower bench. The system offers several sizes of triangular and rectangular forms. Fill frame with floor mix mortar and slope slightly to shower. Building a shower bench with the system is easy. First, install the aluminum frame onto the shower wall. Fill the frame with floor mix mortar (sand and Portland cement), trowel smooth with slight slope to shower and finish with tile. The finished bench is very strong (rated for 400 lbs.) and has the benefit of open space below the bench, unlike many framed in benches. The Better-Bench® at Amazon. After all the tiles are installed and the thin-set is cured (24-48 hours), grout the tiles.Grout is available in sanded and non-sanded forms. Sanded grout is generally used for grout seams greater than 1/8″. Non-sanded grout is used for grout seams 1/8″ or narrower and for use with tile surfaces that could be scratched by sand.When choosing a grout for wet areas use latex fortified mixtures. We used Polyblend polymer-modified non-sanded grout available at The Home Depot stores. Grout, like thin-set mortar, also has a short working time and should be mixed in small batches. Mix an amount of grout that you can apply in less than 30 minutes. Consult the specific instructions for the product you are using, and know that some modified grout products require an admix in addition to water. Prior mixing and applying grout, look over the entire tile install for excess thin-set in the tile joints. If tiles joints are full of thin-set, there will be little room for grout. Remove excess grout between tiles using a small nail or a standard screw driver turned sideways. Mix grout to a smooth, lump free consistency similar to peanut butter. Occasionally mix grout as you are using it and discard once it stiffens or becomes lumpy. Apply grout using a soft rubber grout float. Apply grout to tile using a grout float held at a 30 to 45 degree angle to the tile surface. Work the grout into the tile joints using a criss-crossing motion. Once the grout joints are uniformly filled, tip the grout float to a steeper angle (70 to 90 degrees) to remove excess grout from the tile surfaces. Next, remove excess grout and smooth the grout seams using a slightly damp sponge rinsed frequently in a 5 gallon bucket of clean, cool water. Use as little water as possible, but thoroughly rinse sponge repeatedly during the process. Excess water can weaken grout. Remove grout haze using a dry cotton cloth. After sponge cleaning, allow the grout dry until a haze appears on the tile surfaces (30 minutes to several hours). Remove this haze by wiping with a dry cotton cloth. Grout haze removal products are available for difficult to remove grout haze, but these products should generally not be used until the grout has cured (24 – 48 hours). Some tiles with porous surfaces are prone to collecting grout haze and may benefit from pre-sealing the tile surface with a light coating of tile sealer prior to grouting. If you do this, use care to apply sealer only to the face of the tile and avoid contact with the grout joints as this may compromise the bonding of the grout between tiles. Tile the shower pan and curb. In theory we would tile the shower floor (shower pan) first to promote our desired water path down the wall tile and over the shower pan. But for most shower builds, this layering is not necessary as the shower liner protects this area of the shower. Even if water did get past the tile at this interface, the shower liner will redirect it to the drain. Remember the shower liner runs up the base of the shower walls some distance (usually at least as high as the shower curb) to waterproofing the coves and base of our shower pan. So, for practical reasons, many installers complete the shower pan tiles last, to help prevent damage to them while installing tile on the shower walls and ceiling. Shower wall tile installed and grouted. Next install shower pan tile and grout. To begin tiling your shower pan, dry set you tile in the pan prior to applying thin-set. Tiles should follow the slope of the pan and still have solid support. If tile are unsupported or rock back and forth you may need to cut tiles to follow the slope or use smaller tiles. Some correction for unsupported tiles can be made up with the thin-set mortar bed, but tiles should be relatively stable prior to setting them. Smaller tiles, especially small mosaics (pre-mounted on mesh) tend to work best on the sloped shower pan surface. Check tile arrangement and stability of shower pan tiles by dry setting them over shower pain. Using small tiles or mosaics will help follow the slope of the shower pan. Prior to setting the shower pan tiles, check the drain height in relation to the finished tile height (add a bit of height for the not yet applied thin-set) on the shower pan. The drain should be level or slightly lower than the finished surface of the shower pan tile. Shower drain is adjustable by turning drain riser. If drain height correction is needed, most drains allow adjustment by turning the drain riser, which in many designs, is threaded, and moves up or down with turning. Once satisfied with the tile layout and drain height, remove tiles, clean the shower pan (make sure the surface is smooth and free of any thin-set, grout or debris), and prepare to set the shower pan tiles. 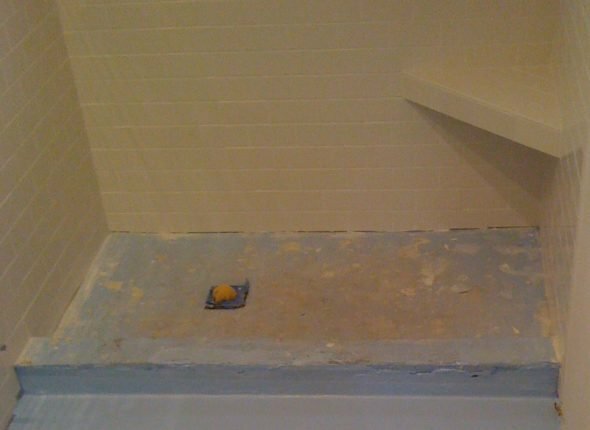 Mix enough thin-set mortar (latex modified thin-set for wet areas) to cover the shower pan. Apply thin-set and set tiles. Ensure good contact between the tiles and thinset — your goal should be that every tile is soundly set into the thin-set with no gaps or unsupported tiles. This is important as these will be weight bearing tiles. Use a covered piece of 2 x 4 to help level and embed shower pan and floor tiles. When setting the tiles, make sure the top surface of the tiles is smooth and each tile flat relative to each other. You do not want high spots or sharp edges in the finish of your shower floor. Prevent high edges and tiles by smoothing the surface of the tiles before the thin-set hardens. A good trick is to use a short piece of 2 x 4 covered with fabric or carpet to help level the tiles as you set them. Push the covered 2 x 4 into the tiles as you slide it over the entire surface of the floor tiles. Use your hand to feel for high spots or sharp edges and correct before the thin-set hardens. Allow the thin-set to cure for 24 – 48 hours, then grout the floor pan. Allow grout to cure for at least 48 hours before applying sealer. Make sure tile surfaces are clean and free of thin-set, grout or grout haze. If necessary clean tile surface with grout haze remover prior to sealing. Follow the directions of the product you plan to use (we used 511 Impregnator Sealer from Miracle Sealants). For most products, apply the sealant to the grout seams using a foam brush, or sponage to saturating each joint. Then use a sponge to lightly coat the surfaces of the tile.Allow sealant to soak in for several minutes. Then, using a clean, dry soft cloth, wipe off the excess sealant from the tile surfaces before it dries. Repeat. Test sealant by dropping water onto the grout and tile surface. If properly sealed, the water should bead and run off the surfaces. If the water does not bead, repeat sealant application until it does. Mount shower head(s) and plumbing trim. Install the shower head arm (supply pipe), shower head(s) and knobs and trim of your controls. 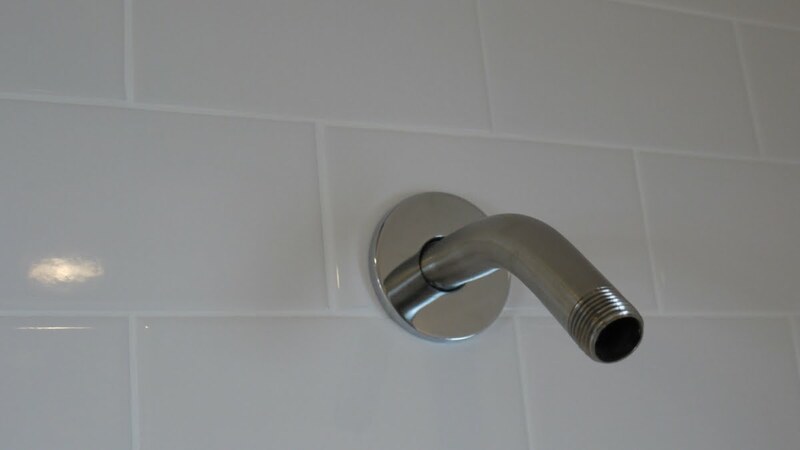 The shower arm is typically a short, slightly bent 1/2″ pipe that is threaded on both ends and finished to match your shower fixtures. The shower arm connects the rough in plumbing behind the wall with the shower head. The rough in plumbing that the arm connects to usually ends with a drop ear elbow fitting designed for this purpose. Often, this drop ear elbow is connected to a short piece of 1/2″ capped pipe (“stubbed out”) when the rough in plumbing is installed. If yours is stubbed out you will have to remove the pipe stub before installing the shower arm. Before you do make sure the mixing valve is off. Shower arm pipe shown with trim cover (escucheon) on. To install the shower arm, first wrap several rotations of teflon tread tape or apply teflon thread dope to the wall end of the shower arm. Wrap the Teflon tape clockwise as you hold the threaded end facing yourself. Proper wrap direction of the thread tape helps maintain the tapes integrity when installing the pipe. With the thread tape applied, pass the shower arm through the wall and into the drop ear elbow of the rough plumbing. Be careful to line up the threads properly to avoid cross-threading the elbow (which is copper or brass and quite soft). Hand tighten to the point of proper alignment. Then wrap a rag or strip of rubber around the pipe to protect it, and using an adjustable wrench or pipe wrench tighten the shower arm 1 – 2 additional turns until the shower arm is properly align. Do Not Over Tighten!! Remember that the drop ear elbow is soft and very hard to replace! Tighten shower arm with wrench protected with a folded rag. 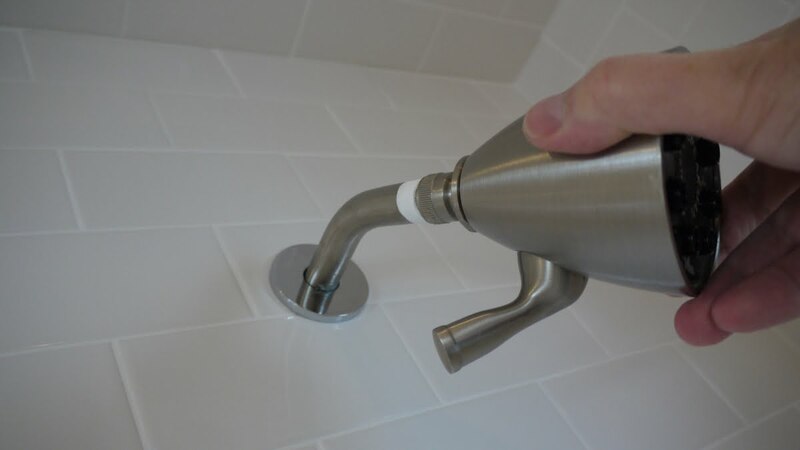 Next, test the shower arm for leaks by capping the shower end of the elbow and turning on the water. Use a flash light to peak into the wall at the drop ear elbow by looking through the space between the shower arm and the hole cut in the wall (the hole should be slightly larger than the pipe). If no leaks, turn the water off, and remove the cap placed to test the shower arm. Next, slide the shower arm escutcheon (round trim piece that covers the hole in the wall) onto the shower arm and slide it down to the wall. 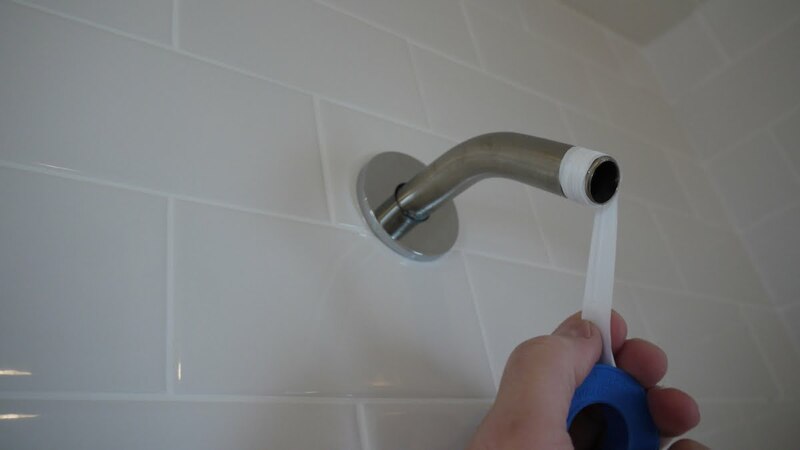 Wrap several rotations of Teflon thread tape around both ends of the shower arm pipe. To install the shower head, first wrap several wraps of Teflon pipe thread tape around the threads of the shower arm pipe. Wrap the tape in the same direction you will be turning the shower head to tighten it (clockwise) to avoid unwrapping the tape as you turn the shower head. Tighten until hand tight, then tighten an addition 1 – 2 turns with a wrench. Protect the finish of the shower arm and shower head with a folded rag if needed. Check for leaks. If leak, re-tighten. Use a folded rag to protect the shower head finish from the wrench. Finally, install the mixing valve trim plate and knobs. Follow the directions of the manufacturer of the product you are using. Trim plates should install flush to the wall. Once installed, carefully run a bead of silicone or elastomeric sealant (lexel) around the trim plate. Use painters tape on shower trim and wall prior to caulk for a clean results. 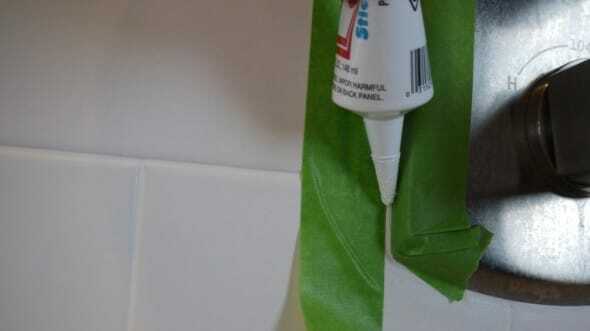 Tape the trim plate and shower wall with painters tape for a neater caulk application. Leave just enough of a gap between the tape for the caulk bead. Smooth caulk with tape still on, then remove tape. If using an elastomeric sealant (like Lexel), work very quickly to smooth the caulk bead as the surface of these sealants firms very quickly. Before using the shower, let the tile sealant and caulk cure for 24 – 48 hours. Remember to refresh the grout sealant and check the condition of the caulked areas periodically. Finished shower. Heavy glass added. Shower framing, plumbing and shower pan complete - shower ready for tiling. HardieBacker 1/2" backer board installed for shower and bathroom walls and ceilings. Paint-on waterproofing/crack isolation membrane (Hydro Ban by Laticrete) applied prior to setting tile. First coat of Hydro Ban waterproof membrane complete. Plan out tile install. Start with level reference. 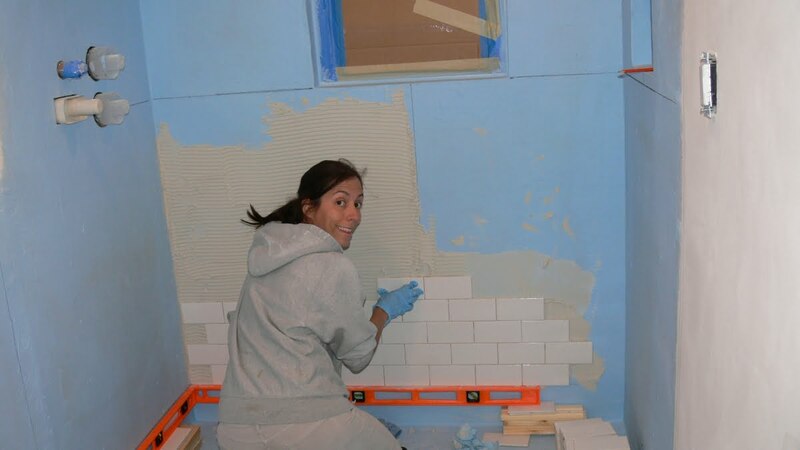 White subway tiles from Home Depot used for our shower and bathroom. The subway tiles we used have self-spacing tabs on the edges of each side and provide a 1/16" grout line. 1/4" "tombstone" tile spacers. Remove before grouting. Shower personalized with a few detail tiles added from a trip to Italy. Check tile arrangement and stability by dry setting them on shower pain. 6.5" x 36" precut marble threshold for shower curb. Shower curb tiled with the same white subway tiles used for the shower walls and ceiling. 6.5" marble threshold used to cap the shower curb. Shower complete with shower heads, and mixing valve trim installed. 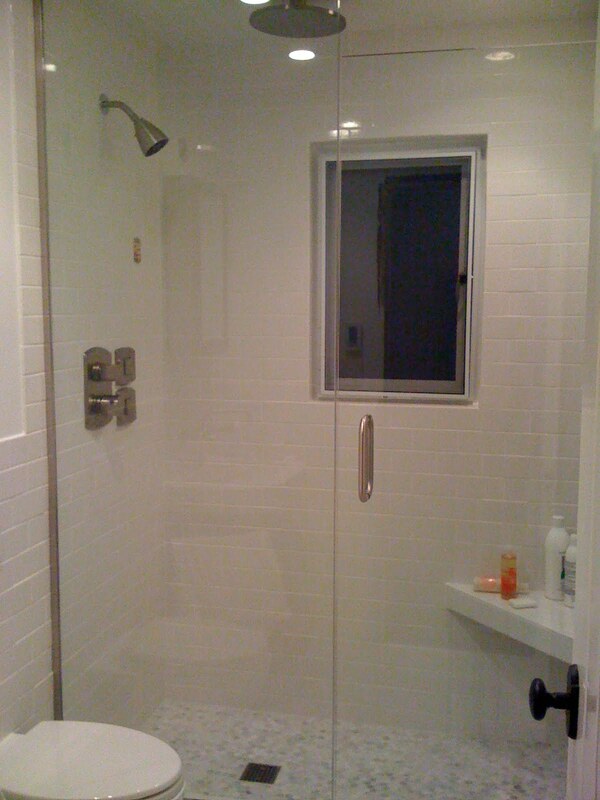 Completed walk in tile shower with heavy glass partial wall and heavy glass door installed. 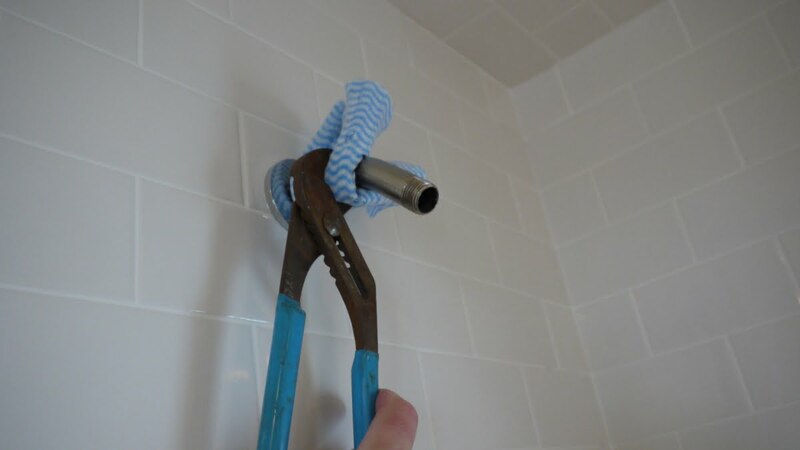 Install shower to hand tight, then tighten 1 - 2 turns with a protected wrench. Installed shower arm and shower head. Hi there, what a great tutorial, it looks fantastic! Could you please confirm the grout color? Poly blend }11 Snow White? Thanks!! Thanks for the feedback. Actually, for the grout I believe we used Polyblend #381 Bright White for the subway tile the shower. The snow white we used on the floor (i will correct this in the article, although either would look great). we an old glass shower cabin that is a ready made one. There are mold issues around and we have a feeling that we need to replace it or build the new one. all your instructions are quite clear… one thing that I did not get – how to install the lass? 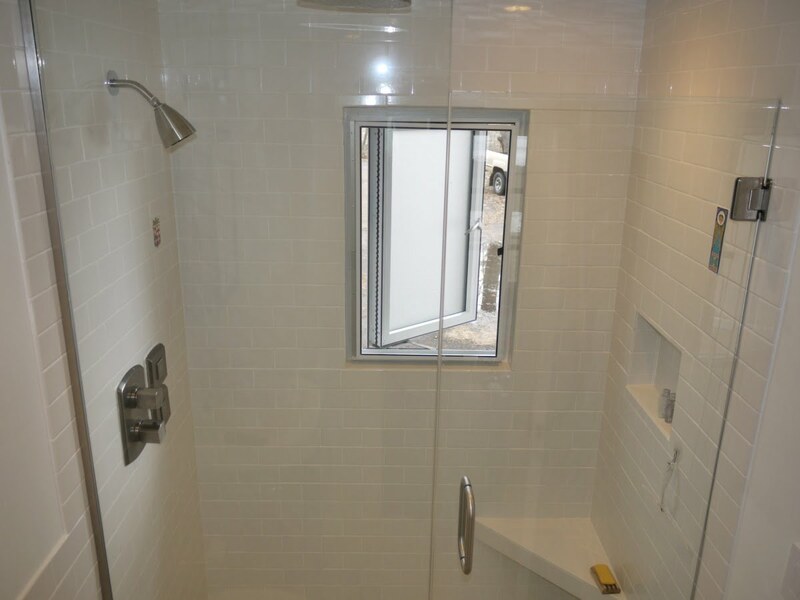 is it possible to use the glass that we have as pert of the existing shower? what to use to hold the glass panels? Thanks for using our site. I apologize for the lack of info regarding the glass door and panel install. 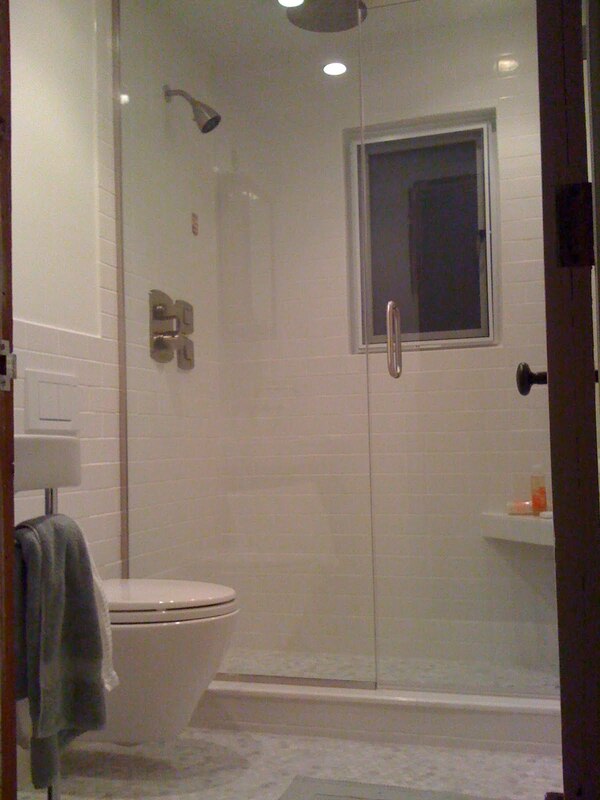 The reason I did not include any info is that we used a professional glass company to install the shower glass. 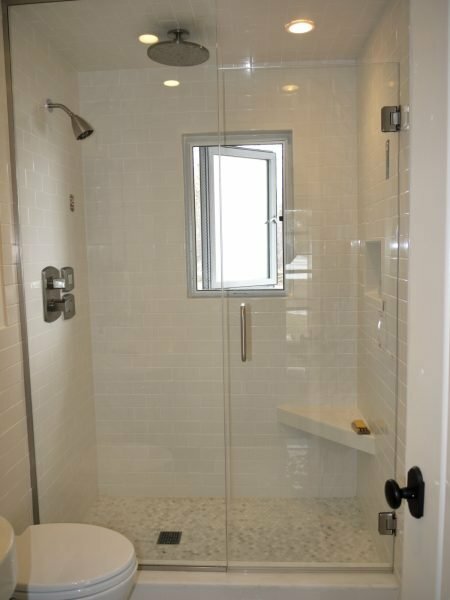 I have installed shower glass in the past, but with the small additional cost for the install (which is typically included with glass purchase, especially “heavy” glass), it make less sense to install the glass yourself as a DIY project. That said, if you have glass that would fit the space, it may be fairly straight forward to re-install the glass (depending on the type of glass and hardware you have). 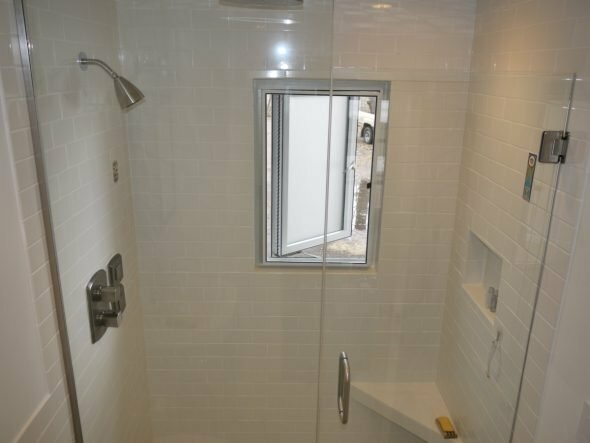 If you have a slider door system, there is typically a header bar or track to mount at either end of the shower entrance with a guide track at the base. This system should be relatively easy to remove and re-install. It will likely have a bracket at either end of the top header bar that screws into the wall. Before you try and get to these brackets, you should probably remove the sliding glass panels. The panels likely have a mounted wheel at the top that rests in a track inside the top bar. To remove try lifting the panels and shifting them out of the track which should allow you to remove them one by one. Once the panels are out, the top bar should be fairly straight forward to remove — either screws on the ends that are now visible with the panels out, or mounting brackets that support the bar. Try lifting the bar up – if there are mounting bracket the bar may just be hung on these brackets which will be exposed when the bar is lifted off. The guide tract at the bottom of the door is likely screwed down at intervals into the floor and / or attached with silicone caulk. Remove the screws as needed, cut or score the silicone caulk with a blade and the track should be removable. If you are dealing with a swinging door system, the door is typically attached by hinges that use screws to mount. Fixed panels are often attached to the wall using “U” shaped tracks (glazing tracks) screwed and / or siliconed to the wall, floor and ceiling which the glass sits in (this is the system our shower above uses). The glass is typically secured in these tracks with rubber seals or silicone caulk. It would be helpful if you could reply with an image of your doors to help guide any recommendations from my or any of our visitors. It would be very helpful if you could find the Make and model of the system you have and look for any documentation on the internet. Good luck. Reply with an image if you can using the “Chosse File” link below to upload an image of your system if you like. These are fantastic tutorials. It will be a year or 2 before I do this but I plan to save these tutorials for future reference. I actually feel like I can do it now. I’m sure questions will pop up as I install, by one I have now is regarding the niche. Did you use a pre-made niche or frame it yourself and cover it with the cement board? If you framed it, how did you do it? Thanks! I created the niche using backer board pieces screwed to a framed box made in the stud cavity of the wall. I added horizontal 2×4 pieces for the top and bottom of the enclosure. I will have to look at some photos to see if I added any wood behind the rear “wall” piece of backer board – I may have just fit it and secured with thinset (I will check). I then added fiberglass tape to all corners followed by thinset. Once the thinset was dry, I applied several coats of paint-on water proofing (Hydro-Ban). I will see if I have some better photos of the process. Thanks for the info. Perhaps you put plywood on the back? To make a box it makes sense to me. I was checking out some pre-fab options and ran across KBRS that makes tile basins, niches, and benches and such. Overall would be very expensive but I assumed you needed to be an expert for all of this. Now I think I can actually tackle it after reading all of this. I would imagine for the pain itself you’ve got maybe $100-$150 in it? A KBRS pre-fabricated basin is well over $800 for the size I would need. I’m still just a bit confused about the slope and exactly how to get it right. I know it needs to slope down toward the drain, but if the drain is at .5 inches does that mean I should chalk a line all around the pan at about 1 inch? That way all the sides are level but slope down? Or would each side be a different height depending on how far it was from the drain? And I assume you do both mortar layers (the one under the liner and over the liner) following the same guidelines? I just got a little confused at that part and know it’s not a part I want to get wrong. Thanks! I just looked back over the images I have and found one showing the niche after I applied the paint-on waterproofing. I am fairly sure I the niche is framed on the sides by the studs and at the top and bottom by 2×4 horizontal blocking (I only had to add the top blocking as there already was blocking in the wall for the original wood paneling). I cut out pieces of backer board for the four sides. I believe these side pieces were spanned the full depth of the 2×4 wall cavity (3 1/2″). The other side of this wall is finished with 1″ cedar vertical paneling, and I think I just pushed these pieces all the way back to the back side of this paneling. The back of the niche, I’m fairly sure is just pushed all the way back to this paneling as well. I may have mounted a piece of plywood behind it, but I don’t think you need one. I know I used a generous amount of latex fortified thin set to hold all the backer board pieces together. The thin set alone would be plenty strong to hold the back piece in place. Once all the pieces are in place; you can push thin set into all the seams and cracks to add strength. Once the thin set was dry, I added the paint on HydroBan. Don’t forget to slope the base toward the shower to drain water to the shower. You can add the slope when you install the tiles if you forget to slope the backer board. 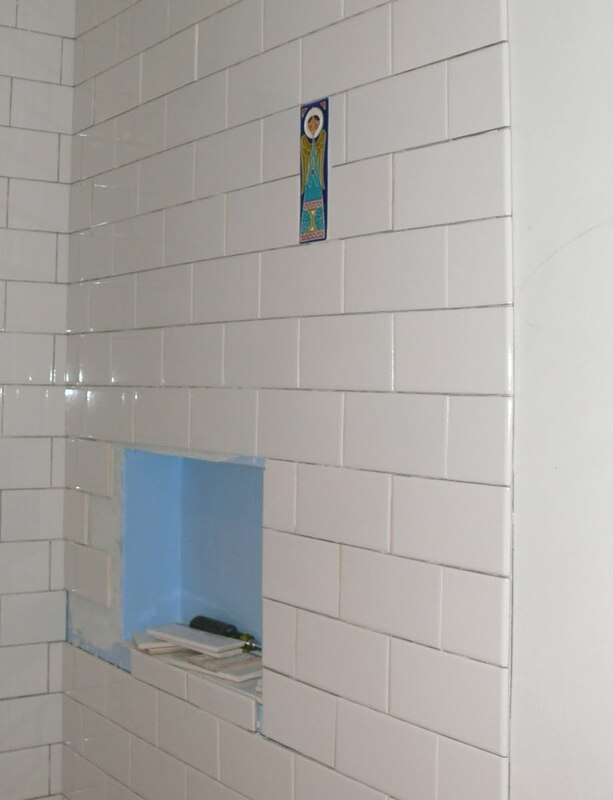 As you can see from the image below, the niche doesn’t have to be perfect, as the tiles will correct for squareness and flatness (depending on your tiles, but even so, you can flatten and square the niche walls when you install your tile, even if it is a small mosaic). When you pour your first (initial) shower pan layer, it needs to be sloped. The recommended slope is 1/4″ or more of the height per foot of distance. To determine the height of the mortar on the walls of the shower measure the distance from the drain to the furthest wall. Take that distance in feet and multiple by .25″. Example: if you have a rectangular shower measuring 2′ x 4′ with a drain in the center, the longest distance from the drain to a wall will be 2′ (minus the size of the drain, but not important). Multiply 2′ by .25″ and you need a drop of at least .5″. So, on the wall 2′ from the drain the height of the mortar will be .5″ (1/2″) higher than the height of the drain. To get it right, place a 2′ level with one side on the edge of the drain and the other against the wall, and then mark the height level to the drain. From this mark add 1/2″ of height. This higher mark is the target for the mortar. Since you will want a level bottom wall corner in your finished shower, you will need to carry this height all around the shower (just use your level). This means that on the shorter sides, the slope will be greater (in this example twice as steep). But, because the slope is relatively small, the difference in slope is not very noticeable as it is only 1/4″ different. Once the first layer is cured and you have your shower liner installed over the dry first sloped mortar layer (above), the second layer just needs to be the same thickness throughout since the slope is already set by the first layer. In reality, many end up adding additional slope with the second layer as it often ends up being thicker at the walls than at the drain. Even with a bit of an uneven slope as seen above with the shower pan and seen here with the dry shower pan and thinset applied to the backer board seams, you can easily make up for any imperfects when you install the tile. Sorry I don’t have better pictures, some of my earlier projects suffered from a relative lack of good images. Feel free to stay in touch when you are working on your shower. Good luck and enjoy, I think you will be surprised how nice a shower you can make. Sorry to keep bothering 🙂 I just saw some product called quick pitch that has the correct slope that would take the guesswork out. Any experience with that? Also, should epoxy grout be used or is that overkill? Since it is such a wet area I didn’t know if epoxy would be the best thing to use. I used a product from Home Depot recently called Fusion Pro which is a premium grout that doesn’t require a sealer and is pre-mixed and is supposed to be good for preventing mold and mildew. Since so much water will be hitting the grout I guess I just want to get it eight where it’s low maintenance and lasts a long time. Any thoughts about that? In fact, thanks for the great questions, they provide excellent info for other readers as well. Epoxy grout is very different from traditional grout. Epoxy grout is an epoxy resin combined with a filler to create a very hard, smooth, permanent filler between tiles. Just like other epoxy compounds it is incredibly durable, stain-resistant and strong. It is also very waterproof and, therefore, does not require sealing. But, just like epoxy glue, it is very unforgiving as it dries and almost impossible to remove from tiles and other surfaces after it dries. Because of this and its’ relatively short working time, it can be difficult to work with, especially for beginners. Aesthetically, it is also different. 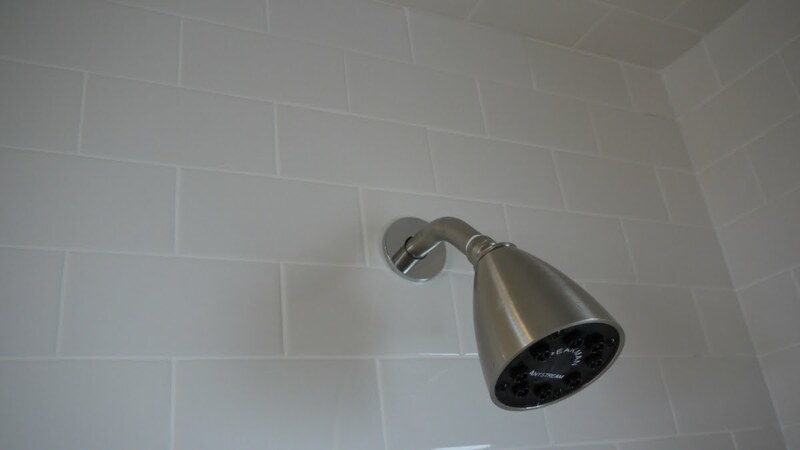 It dries to a very hard, smooth surface that gives the grout lines a shiny appearance compared to traditional grout. Traditional grout is a mixture of portland cement with or without sand and other additives. Traditional grout is very forgiving and has a relatively long working time, depending on the specific product you are using. Latex and other additives add strength and durability and improvements in water resistance. Made up of cement, with or without added sand, traditional grout has a matte, grainy appearance similar to masonry in brick walls giving it a traditional feel. Personally, I prefer and would recommend traditional, latex fortified grout. If you have larger tiles, you should likely use a sanded grout if you have small or very narrowly spaced tiles (like ours above), use an un-sanded grout. If you are concerned about water resistance, I would concentrate on waterproofing your tile backer board, as this is probably a much better way to protect your walls considering the eventual cracks, etc. in any tile / grout job. Thanks for the very detailed and helpful response. This is all making sense to me now. No doubt I will be referencing you often! Thanks for the great tutorials and material lists, they have been invaluable as we tackle our own bathroom renovation. I believe you said you used hardibacker for all of the walls in the bathroom, not just the tiled surfaces. We are considering this as it is a small room and we are tiling the shower and half of the walls anyway. How did this work out for you? What did you use to joint/finish the non-tiled areas? Did you skim coat with joint compound and paint? Is your finished surface holding up well? I am worried about spending all of this time and $ on a bathroom just to have it end up looking amateur where we don’t have tile. Thanks again! Thanks for using the site and thanks for the positive feedback. 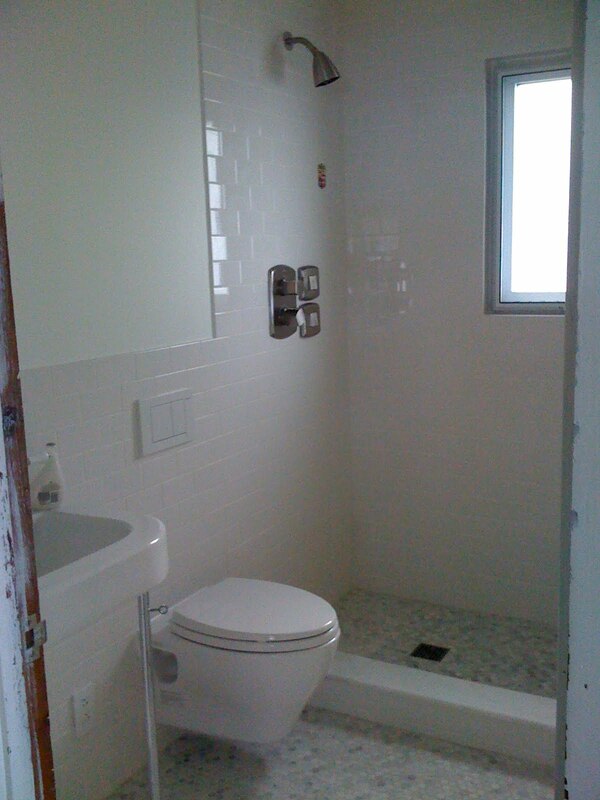 We used tile backer board for our entire bathroom – ceiling, walls (and floor on top of plywood). We tiled the walk-in shower and behind the sink and toilet, and painted everything else. It was a great way to do it. For a bit more money, you get the absolute best wall covering for a very challenging environment. 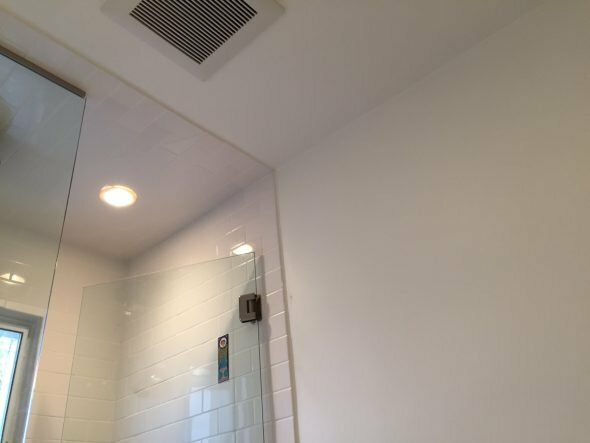 I would also recommend a high-quality bathroom exhaust fan (I like Panasonic – very quiet and functional, also buy a digital fan countdown timer to wire to fan to (see in the below photos) – it allows the fan to run for a set time after you leave the bathroom – awesome!. We used a mix of Hardiebacker and Backerboard by Certainteed. Both have a smooth finish, making finishing and painting them much easier. I would not use straight up cement board unless you plan to skim coat it for a smooth finish. As you can see in the photos, we fastened the bathroom wall backer board panels to the studs with roofing nails (for the shower we used screws, but later switched to roofing nails as it was much easier and left a smoother finish). 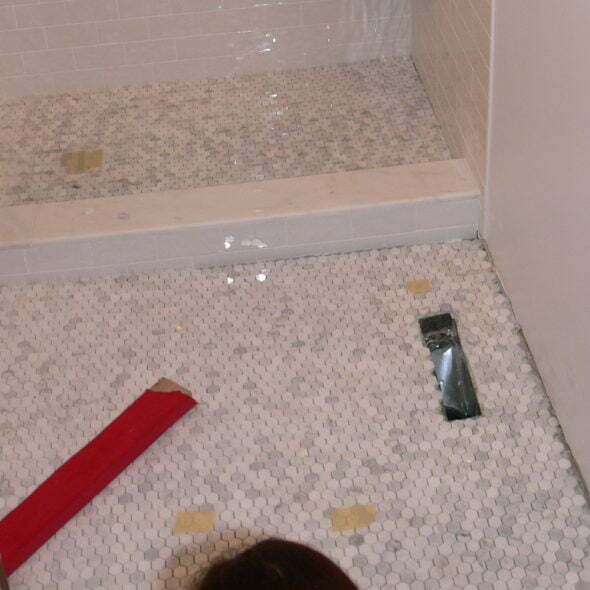 After the panels had been installed, we used a fortified (latex added) tile thinset with an appropriate fiberglass mesh tape (check that the tape is designed to be used with tile thin set) for the seams. Once the thin set was dry, we used drywall joint compound to smooth the walls, just like you would with standard drywall (apply, smooth, sand, repeat, etc.). 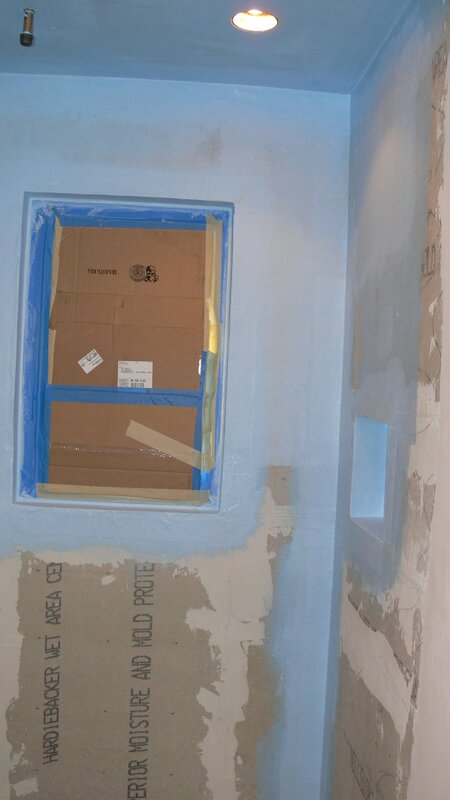 After we were satisfied, we applied a high-quality drywall primer and a finish coat of a quality bathroom paint. It has been several years and the walls look like new. I would totally do it again and cannot imagine using lesser products (green board) for such an important, difficult area of your home. This is especially true for smaller bathrooms that tend to have higher moisture content in use. Smooth surface fiber cement tile backer board (HardieBacker, BackerBoard by Certainteed) used to sheath bathroom walls and ceiling. Seams filled with latex-fortified thinset over thinset approved fiberglass mesh seam tape. Joint compound used to smooth walls after thinset is dry. Walls finished with tile behind toilet and sink and primed and painted everywhere else. Bathroom wall and shower today (March, 2015) after 3 years of use and original paint. Bathroom ceililng and shower today (March, 2015), notice Panasonic exhaust fan. Good luck and feel free to upload a photo if you like. Very inspirational bathroom! For the vertical wall entering the shower did you use tile with the bullnose on the 3″ side. If so we’re did you find it? My local home Depot only carries it with bullnose on 6″ side. Also when you cut the tile in half And it’s grouted I would think the sharp edge would be visible in the shower what are your thoughts. Thank you. 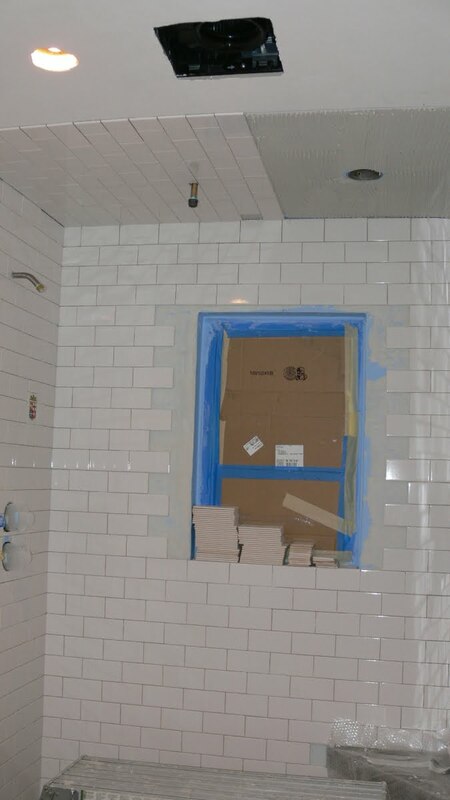 Yes, we did use end bullnose (3″ side) tiles to finish the leading front edge of the shower. Like you, we did not find them at The Home Depot. We instead ordered them from a local tile store in Plymouth, MN – Tile X Design. You are also correct that when using a cut half tile of this bullnose material, the rear seamed joint does include the “sharp” cut end of the bullnose. Although not that noticeable, you can soften the edge with a tile stone or similar abrasive tool. I suspect you can also order the same bullnose tile in half sizes “3” x 3″. I’m leaning towards a bead of caulk painted to match the walls. I wonder if you can smooth the end pieces like you said with a stone and then paint them white or better yet grout the ends. I think adding a vertical border takes away from the clean look. Here is a photo showing the leading edge a bit better. I took it this weekend. Unfortunately the image doesn’t show the tile that well, but it gives you an idea of what it will look like. These are bullnose tiles. However, I think standard tiles with some grout / paint / caulk will look fine too. I almost skipped the bullnose tile and just used the standard tiles. The difference, if I remember, is the bullnose has just a bit more finish wrapped around to the edge. You should check your tiles, some of the subways have spacer tabs molded into the tile that may look odd. Regarding the cut edge of the half tiles; we oriented the tile so the cut edge was toward the shower. Once grouted, the joint blends in fairly well with the tile. If you look close, you can see the difference of the cut edges. I guess the other option, that neither of us mentioned, would be to use the long side bullnose from Home Depot and turn them sideways to create a border around the shower. You would obviously need to cut some half tiles to make the straight edge prior to the border. Any advice on making an accessible shower pan (no threshold)? Also, what kind of toilet is that? I have a very small bathroom and that looks like a space saver. Thanks for the question and thanks for using the site. I have limited experience with curbless showers. There are some excellent resources available to help – on of my favorites is Fine Home Building Magazine / Website. Here is a discussion about this very issue: discussion on curbless showers. From my understanding, the main issues are the requirement of a larger shower pan area which in turn requires a deeper mortar bed which will weigh more. Another issue is the potential for flooding related to building codes. You should clean the tile as needed prior to applying any sealant. Make sure there is no residual grout or grout haze on the tile prior to sealing. That said, sometimes using the sealant to help release difficult to remove grout haze is helpful. 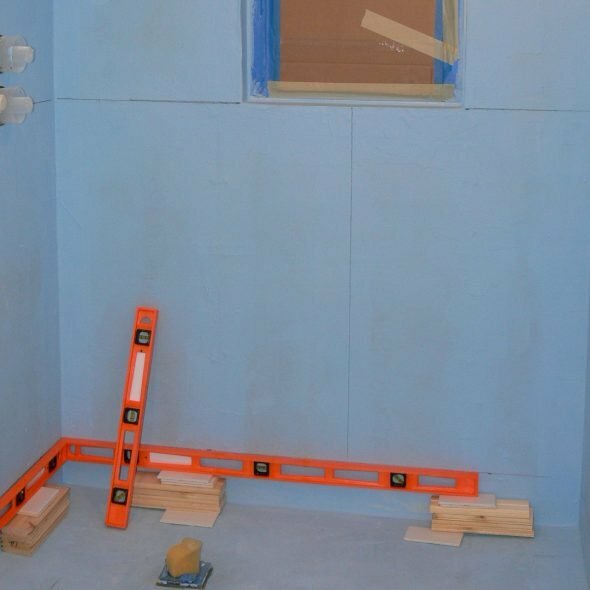 I am wondering about the use of the green water resistant wallboard for my shower walls as I will be using that 1/8″ plastic shower wall material for my walls. or should I still use the cement board? I assume you are installing a fiberglass or acrylic panelized or one-piece shower insert. These systems differ depending on the manufacturer, so the best information may be the install instructions from the manufacture of the product you are using. Many of these units are designed to be installed directly to the wall studs. Finishing around the unit is then completed using a water-resistant wall board. As with any wall board to be used in bathrooms and especially around shower areas, I would recommended not using gympsium based "green board" or similar products. These products tend to fail in high moisture environments. There are many excellent products designed to be used in and around showers — see the chart at the beginning of this article. Since you will likely be painting the board, choose a product with a smooth finish. Cement boards are excellent backer boards for tiling, but a fiber cement smooth finish product like HardieBacker would be a better choice. Hey I really appreciate this article helped me out tremendously, but I was wondering when building my mortar shower pan, do I build up to and around right under the neck of the drain or only up to the outer second peice of the drain assembly where the weep holes are? Thanks for the kind words and using our site. When pouring the top layer of floor mix, first cover the weep holes of the drain with pebbles or tile spacers to help improve the drainage path into the weep holes. Then pour the floor mix over and around the drain and covered weep holes bringing it flush to the top drain flange level. Great site! I am ready to tape my seams and thinset them, but I was curious if you taped the seam between the shower pan and cement bord? From your picture it looked as though you did so? If so did you also use topical membrane on those seams as well? Just worried about creating the mold sandwhich if you will. Thanks! Regarding the corner seam between the cement board and shower pan, I did not tape this seam. This bottom section of cement board is embedded in the mortar of the shower pan and therefore very stable. I did, however, fill it with thinset to even and smooth this interface of the cement board and shower pan. For all of the other cement board seams, I used cement board approved fiberglass tape embedded in a latex fortified thinset. 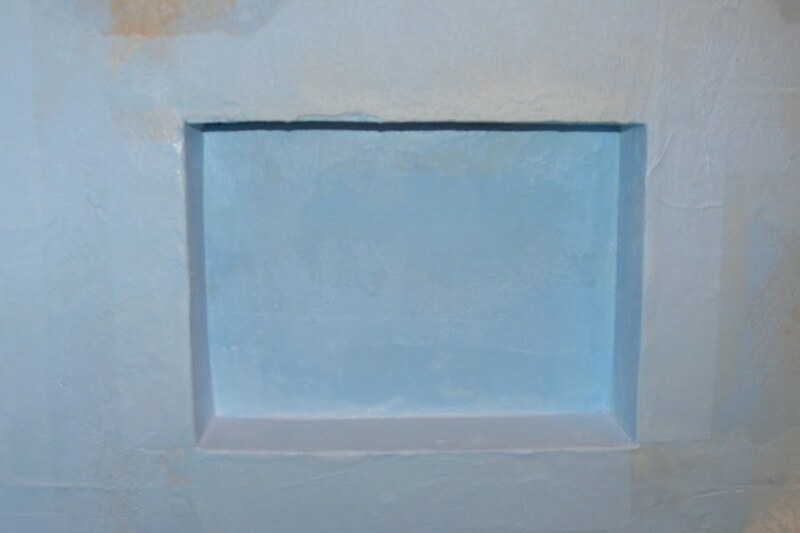 The waterproofing of the shower pan is not necessary (any passed water is stopped by the shower liner embedded in the shower pan), but I believe the paint-on waterproofing of the cement board is a very good idea. Enjoy you shower building. Feel free to upload an image of your project using the "Upload an image" button below. I’m so glad I found your blog as I need to build a shower stall from scratch. Well almost the plumbing is all ready in. I have never done it before. I do have a question however. 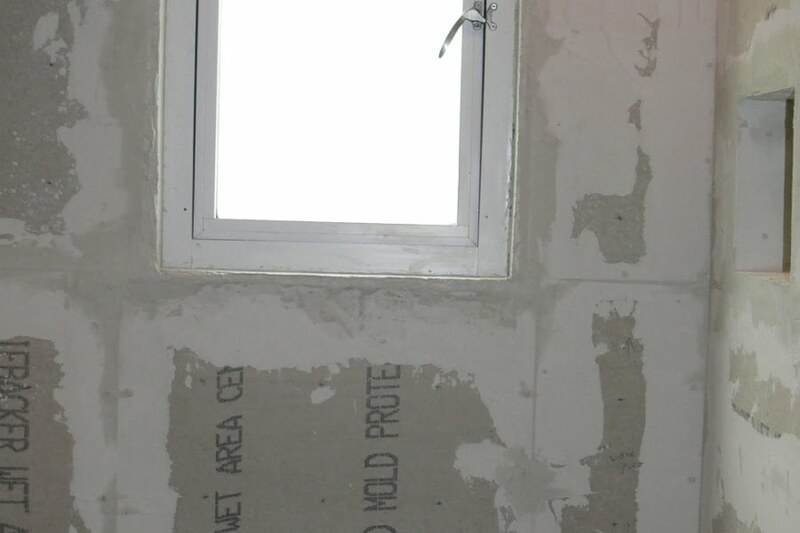 The area I’m building it in has new drywall in it and I’m would like to know if I can cover it with ¼” “Fiberrock” over the existing drywall or if I need to pull out the existing drywall and replace it with 1/2”. I am intending to water proof with “Redgard” everywhere but am somewhat concerned about deterioration of the drywall over time. I would remove the drywall and replace with an appropriate tile backer board approved for shower use. The paper of the drywall will likely eventually get wet and grow mold. Thanks. Will take your advice. Enjoyed reading over how to DIY on the shower which helped me with where to start and how it needs to be done. A question I have is my small shower is right in from of my bathtub and I’m wanted to rip out both the shower and tub and replace it with a walk in shower. I have an idea on the best way to start but wanted to know if know of any sites other reading material that can help me better understand how to build the walking part. I can cap the water lines for the tub and plug up the drain for the tub but would like to have a better understanding where to go from their. Another great article, and beautiful project. I am about to start my bathroom, and hope it turns out like this one. Just one question, what is the purpose of the mesh used on the curb prior to the liner going on? Thanks for the kind words and question. The mesh holds and reinforces the mortar layer applied to the curb. in your materials list, you listed only 10 square feet of tile was used for the walls. was this a typo? i measured my existing shower stall and i need about 5 times that (i’m measurement challenged so it kinda alarmed me). was it 10 or 100? thanks. I believe the 10 sq ft is referring to the price per 10 sq ft ($18 / 10 sq ft). You are right, you will likely need in the range of 50 – 100 or more sq ft of tile coverage for a typical shower. You get a 10! One question, how do you cut out for plumbing fixtures and get holes for grab bars? You can cut holes for plumbing using a few different methods. If you have large tiles, or would like to cut the entire hole on a single tile, use a diamond wet/dry hole saw (~$25+) drill attachment. Wet the tile as you cut to control the temperature. To drill holes for mounting bars, use glass/tile drill bits. Many will plan to drill holes over grout lines for ease of drilling and to help avoid damaging the tile. If installing grab bars, consider the expected load on the bars and consider fastening into studs if possible or heavy duty anchors where studs are not accessible. I have a question really. Can I tile over a painted shower pan. The paint is a water sealing type. Any thoughts? This info is proving to be very helpful! I have a “self taught handyman/carpenter” who has remodeled a few bathrooms for customers already & his work is very impressive. When I asked if he uses the plastic wrap or waterproof paint on the backer board before applying the tiles, he stated “neither”. I want him to do my bathroom for me just like this, taking out the tub & making it a walk in shower (but no bench). I hope when I show him these step by step instructions he’s not insulted. I recently followed your tutorial here to create a shower pan, however I have a concern. When my husband installed the faucet he ran quite a bit of water in the shower pan (which had previously been dry for over a week) and now the shower pan is still wet. I could hear the water drain through the weep holes when it was running, but the moisture is concerning to me. It’s now 4 days later and still appears damp. Any ideas of what’s going on here/how to fix it? I appreciate any insight you may have. I wanted to take a moment to thank you for this excellent instructional. I have rehabbed two bathrooms in my home and am about to start a third and a fourth. The second one had a custom shower pan and I was very frustrated with the contractor who did the work. He apparently doesn’t own a framing square. “Can’t see it from my house” was his attitude which is the reason I do so much of my own work. (plus I love the work). The glass guy’s first comment was, “That pan isn’t square!” but he was able to work around it. Finished product is fine (only I know it isn’t square) but now I have the confidence to do it myself. Thanks very much. One question on the tile work. You suggest starting a good bit from the bottom for the walls, I assume to allow for the pitch of the floor. How much of a tile do you allow for the last course? On my job the drain was in the center so all the walls started at the same height and I used tile with a flared base at the same height all around. The new job will have the drain at one end. The bottom tiles, then, are not a full height and each is tapered according to the pitch of the floor? I went back to review. You complete the wall first and do the floor last. I did the opposite and placed the base of the wall tile on top of the floor. This seemed better from a water run-off standpoint. Your way, however, eliminates the issue with the line where the wall meets the base not being as precise and seems to make for a neater line. Have I got that right? I have a want to build a shower from scratch. Removed the old tub and moved everything, including plumbing to a corner of the bathroom. I want to install tile of the walls and floor. I understand all that you are stating, BUT I have an elderly mother that will be in a wheel chair very soon. Need to build a rolling shower. The house has a crawlspace and not a basement. I guess I need assistance on building a shower pan box that is recessed. I have been researching for some time and getting a lot of information, BUT I still haven’t found how deep I can build the pan box and about what is the approximate depth of the first application of Mortar? Also, you stating that it is dry mortar – SO just add enough water to make the mortar moist and pack it down? Thank you very much in advance of your help. Thanks for the questions and sharing your project. Let me do some searching for resources regarding building a curbless shower. 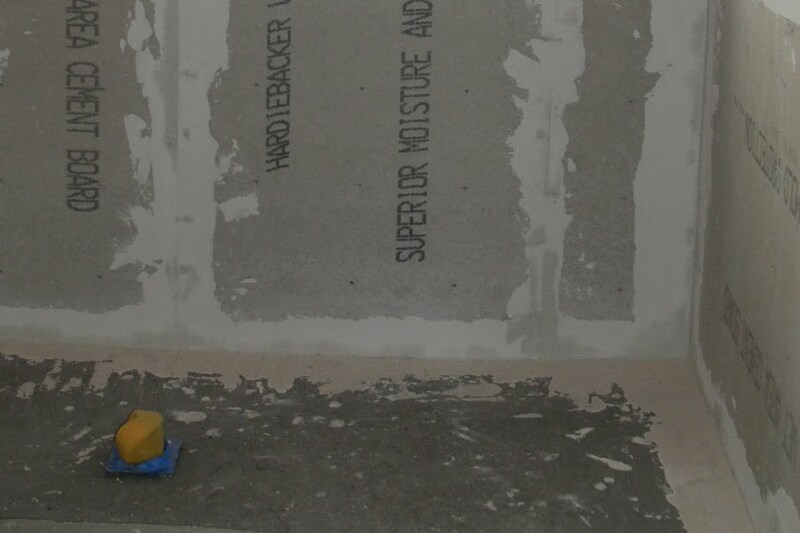 Yes, the shower pan mortar is dry pack – add just enough moisture to activate the cement. You should be able to form a ball with the mortar that holds its shape but doesn’t release water when squeezed. Add an Image to your comments (Allowed file types: jpg, png, maximum file size: 2MB. Amazon Associate Disclosure: As an Amazon Associate I earn from qualifying purchases.